Surrounded by vibrant forests, Devarayanadurga is a trekker’s paradise just about 70 kms from Bangalore. From there, you can head to Siddara Betta for another adventurous hike. Neighbouring district, Tumkur, has plenty of trekking getaways. And Devarayanadurga is one of them. Less popular than other trekking destinations, this little gem comes surrounded in forests and is perfect for a day’s getaway. Devarayanadurga is especially great if you are a trekking novice and want to start off easy. At the base of the hill, there’s the Bhoga Narasimha Temple that’s been around for centuries. You can check out its rustic architecture before hitting the kachha path to the top. The climb shouldn’t take you long. Around 30 minutes of trekking (and sometimes crawling) will get you to the summit. But the view is spectacular. Not just do you get a glimpse of the temple below but also an eyeful of the green forests that are spread across the landscape. These hills are also great to for bird watching. And you should keep your eyes open for the rare Yellow Throated Bulbul. Since the climb won’t take you long, we recommend that you stop by the surrounding attractions. Around 10 kms from Devarayanadurga, there’s a serene natural spring called, Namada Chilume. However, if you want to continue trekking, head over to Siddara Betta. An hour’s ride from Devarayanadurga, Siddara Betta is ideal for trekking and cave explorations. 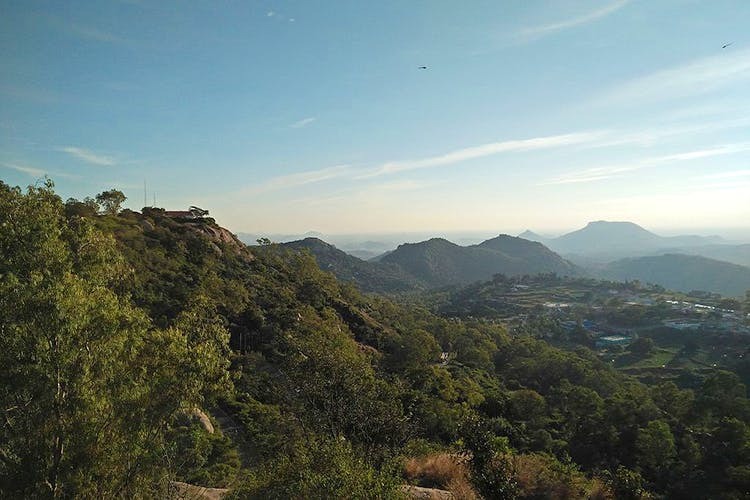 It takes a little more than an hour to conquer Siddara Betta and the climb is pretty steep. In between, you can dive into dark caves and snoop around. Once you’ve got to the top, there’s an old fort and fantastic views waiting for you. Since Devarayanadurga is at an altitude so it enjoys fantastic weather through the year. However, skip the monsoon season to avoid slippery slopes.